The activity with the most responses i.e. the Wednesday’s Discussion being the Hike Group Chat will now resume on the WhatsApp Platform. This new development was taken well by all the Members of the North, South, West and East Group. This decision to revert back on WhatsApp was made upon the request of our loyal Hike Group Members. So we @SourcingAdda now have 8 groups in total as before namely Pune, Mumbai, Bangalore, Hyderabad, Chennai, Delhi, Kolkata and Gujarat. Where we’ll continue all our activities including our favourite discussions we all await eagerly to add to our knowledge. Well this brings an end to our discussion and I’m sure you’ve added to your knowledge as I have. So many views expressed. Now wasn’t that a great session leaving you enlightened and anyone with the willingness to learn. A big thank you to our fellow Talent Acquisitionists for sharing their ideas and perspective I’m sure all of us present and the ones reading this that means you have also benefitted from this recap. To get more updates to our upcoming activities please follow @SourcingAdda and to avail the early bird discount for #TASCON16 another amazing place to network and learn from the Thought Leaders in the Industry register fast. Trust me when I say you’ll have an experience that is worth attending. Gone are the days where job seekers went through job ads in newspapers while employers waited and hoped that the right candidate would walk in. Most recruiters and human resource departments have resorted to modern methods of sourcing candidates. One of the modern ways of recruiting is through Social Media platforms like LinkedIn. Everyone who is anybody most definitely is on LinkedIn so getting desired applicants is now easy. Most Sourcers looking to fill in a vacancy would do better if they used social media sites. These sites with a huge database of Candidates also have at their disposal all the necessary information a Recruiter is looking for and is cost effective too. Social media platforms like Facebook and Twitter allow employers to post job ads on these sites, apart from this they can even swift through potential candidate profiles and create a selection list of candidates that are suitable for the post. This is possible because these sites also give all the necessary information to Sourcers. Therefore they are perfect ways to source Candidates with caliber. They can even help you schedule your job postings at an appropriate time that yields maximum results. Well if you thought that social media is probably the only trend that most employers follow to capture candidates you are mistaken. Because aside from Social Media Recruiting you also have Mobile Recruiting as the recent trend making its mark, due to its availability. Besides it is easier for most individuals to access as it is flexible. The flexibility it provides enables individuals not only to view job postings but also to apply to the ones that interest them instantly no matter where they are or even if they are on the move. When conducting Mobile Recruiting you need to ensure that your job posting is visible on a small screen like a Mobile and is easily viewable without disruptions. Both these tools if used together can boost your search for the right Candidate at it gives you access to Passive Candidates apart from the active ones. Each tool has its own advantages that can speed up the process of Recruiting and capture suitable Candidates for the vacancy. Therefore for modern Recruiters knowledge about Sourcing Candidates via Social Media channels and Mobile Recruitment are essential. Let’s not forget our all-time favorite Recruiting methods of communication like a simple message, email and the most effective way to verify the information making a call and then having a face to face interaction with suitable Candidate. These are some of the most effective methods of sourcing Candidates that have served Recruiters well and continue to be as effective as before. So go ahead and use these methods to receive results and select the suitable Candidates. It’s 2016 and we’re all wondering what this year has in store for us. On that particular note it’s only right that we take a moment to think about what the Recruiting Trends look like for this year. Having highlighted that @Souricngadda every Wednesday we hold discussions where our members get the opportunity to interact with like – minded individuals and add to their knowledge. Well we received some interesting perspectives through this discussion and now it’s time to be patient and see how much of it comes true. In the meantime to get real time updates to our upcoming events follow us @Sourcingadda. And while you’re waiting to see if these aspects turn out to be true you might want to be a part of #TASCON16 and add to your knowledge as well. The Talent Acquisition Industry is constantly evolving with professionals implementing new and improved techniques for Talent Sourcing. It’s common knowledge that finding perfect Candidates is like finding a needle in a haystack it’s almost impossible. As Talent Acquisitionists most of us usually make hires based primarily on Employee Referrals upon the request of Employers. More and more Company’s now rely on Employee References to fill positions fast. But how do you boost the quality of hires via Employee References? The conversation above has definitely shed some light on the topic of discussion and if we implement them in our hiring strategy appropriately will certainly assist the Recruiting process thus landing us with quality hires through Employee References. In the meantime if you’d like to be a part of such discussion in future then be sure to follow @SourcingAdda for real time updates to our upcoming activities and events and join our Hike Groups. To add to your knowledge make sure you attend the most exciting event of the year #TASCON16 to experience the extraordinary and make moments that are worthwhile as you enjoy and learn more about the Talent Acquisition Industry that we’re all passionate about. Hike Group Chat – Should a Recruiter’s LinkedIn profile be personal or in sync with the Company’s vision or policies? There has been a longstanding debate about whether a Recruiter’s LinkedIn profile should be personal or in sync with the Company’s vision/ policies they work for. A discussion encourages two perspectives leaving you with mixed responses. 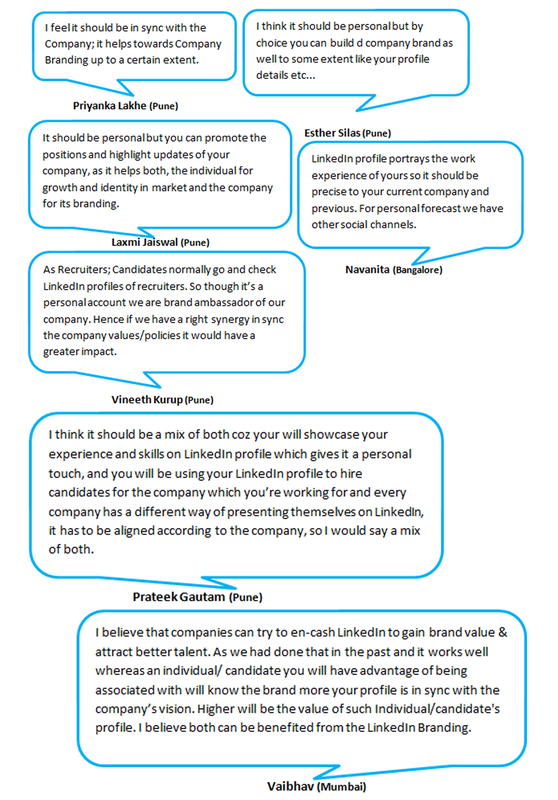 In such a scenario reaching a conclusion is difficult hence @SourcingAdda we decided to get to similar ground based on the suggestion of the Hike Group Chat member Harsh thus the Wednesdays discussion topic was on, “Should LinkedIn profiles be personal one or should it be in sync with the company’s vision/policies where a Recruiter works?” here’s what was discussed……. Based on the conversation above we can conclude that while having a LinkedIn profile should be personal you can also promote the Company within your profile details by mentioning the Company name that you are currently working at. In this way you can also brand the company simultaneously besides there are other Social Media channels to utilise for personal branding, don’t you agree? So evidently a mix of both is essential, for similar reasons being either personal or employer branding making your LinkedIn profile two sides of the same coin. Amazing isn’t it? If you like this particular post then follow @SourcingAdda for real time updates to our upcoming activities and be a part of them as well while you enjoy as you add to your knowledge.